Starting from VW’s Herndon VA headquarters, the two drivers will circumnavigate the 48 contiguous states, racking up 8,000 miles in attempt to set a new world record for Lowest Fuel Consumption Across 48 States in a Non-hybrid Car. Leading the two-man team is Wayne Gerdes, who founded cleanmpg.com – an online group focused on improving fuel economy and decreasing emissions. Gerdes has set various mileage records with over 100 vehicles. He has already set the bar for Lowest Fuel Consumption in the Lower 48 U.S. States in a Hybrid Vehicle. Gerdes wingman for the two-week roadtrip will be electronics engineer Bob Winger, long involved in a slew of energy and conservation projects. “It’s going to be a great adventure and I’m confident we can improve upon the current record of 67.9 mpg in the fuel-efficient Passat TDI,” Gerdes said. 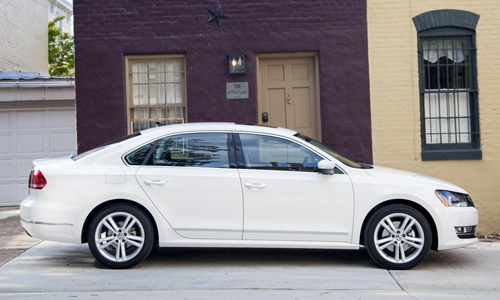 Though an ambitious goal, setting mileage records is one thing you can do in a 2013 VW Passat TDI. Touring the country in a Jack Kerouac-channeling adventure is another. However, you cannot jump the Grand Canyon in a 2013 VW Passat TDI without some serious modifications and add-ons. You would be ill advised to attempt any river fording in the little sedan as well. The daring duo left Virginia today at noon Eastern Time. Their exploits can be followed on VW’s social media sites - @VW, #VWTDI and on the brand’s Facebook page. Clean Diesel engines are just one element of the firm’s approach to sustainable mobility, referred to as its Think Blue philosophy. Volkswagen employs diesel, electric, hybrid, and smaller turbocharged gasoline engines in an attempt to be one of the most environmentally friendly automakers in the world, including the factories the cars are built in and the processes used to make them. For the world record attempt, the Passat TDI will exclusively use Shell ultra-low-sulfur diesel fuel, available at nearly 8,000 Shell stations nationwide, and Continental PureContact with EcoPlus Technology tires, featuring Tg-F polymers that reduce rolling resistance improving fuel efficiency. The record-seeking Passat TDI has been equipped with a gauge to precisely measure fuel economy and a Motorola smartphone to fulfill Guinness World Records tracking requirements and long-lasting connectivity. In closing, you could text while driving a 2013 Passat TDI, but it would be a very bad habit to adopt. Though we are sure Gerdes and Winger will be tweeting and posting as they proceed through the country, it won’t be the driver doing those things. That’s an excellent reason for having a wingman or woman on any roadtrip.